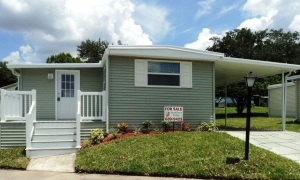 StrawBerry Ridge is a 55+ community near Tampa, Florida, that currently has an excellent selection of manufactured homes for sale, many of them recently updated both inside and out. Each home in our age-restricted retirement development in Valrico is an affordably priced one-level structure that is designed to facilitate the low-maintenance retirement lifestyle. Instead of continually having to worry about the upkeep of their homes, residents of StrawBerry Ridge are able to devote more of their time to staying active and having fun in the company of friendly neighbors of similar age. After taking a moment to peruse our current listings of manufactured homes for sale here, consider what else will be available to you as a resident of StrawBerry Ridge. Not only do we have a wide array of resort-style amenities on site and structured activities taking place throughout the week, we are just a short drive away from Tampa, Florida, and its many points of interest. From StrawBerry Ridge, it will take you less than half a tank of gas to get to historic Ybor City, Busch Gardens, Tampa’s Lowry Park Zoo, the Florida Aquarium, and much more, including mile upon mile of beautiful white-sand beaches that are perennially ranked among the best in America. Buying one of the manufactured homes at StrawBerry Ridge will mean having all of these attractions practically right at your doorstep. Please contact us today to request more information about our current selection of manufactured homes for sale near Tampa, FL.